Yellow, orange, white; yellow, orange, white – that famous color combination from candy corn just screams fall festivities now, doesn’t it? 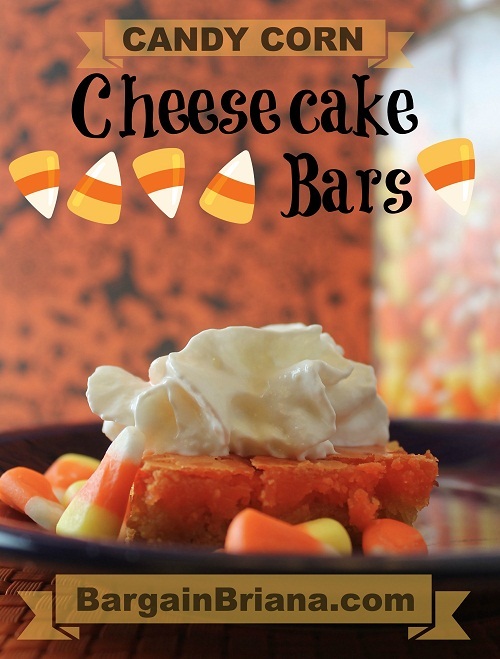 These classic cheesecake bar cookies in candy corn colors are ready for toting to your next Halloween party, bonfire or fall church supper. 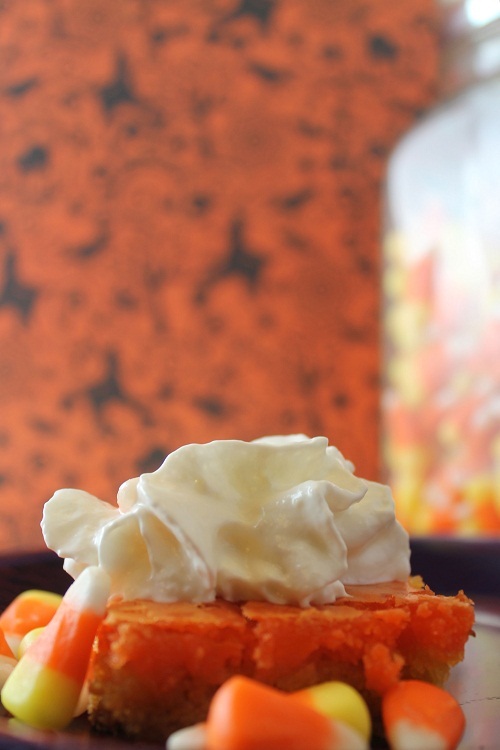 Or tuck them in your picnic basket for a sweet treat at the pumpkin patch. Spray a 13×9 pan with nonstick cooking spray. Mix cake mix, butter and egg in a medium bowl. In a separate bowl with an electric mixer, beat cream cheese, butter, and eggs until batter is mixed well. Add vanilla, salt and powdered sugar into filling. Color the batter orange. I accomplished the color shown by using Wilton Rose Pink and Sunny Yellow gel colors. Pour into prepared pan on top of crust. Bake for 50 to 55 minutes, until mostly set (center will still be a bit “wiggly”). Let cool completely. Store in refrigerator. Optional: Top with a dollop of whipped cream before serving.